Blog | Configuring Lucee 5.1 with Apache 2.4 on Windows Server using mod_cfml. After a bit of Googling, I decided the best approach would be to leverage the mod_cfml module for the task. 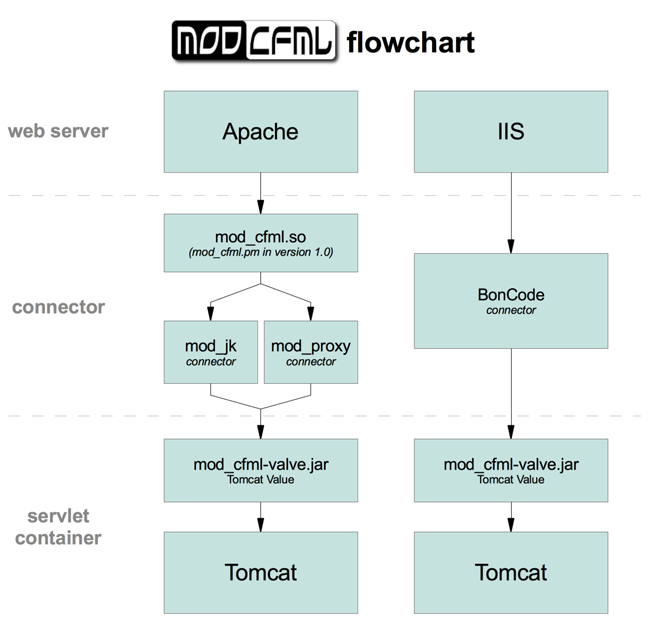 Mod_cfml is a community-driven suite of programs that automatically configures Tomcat hosts to match hosts created in Apache or IIS. Mod_cfml removes the need to configure web sites twice - once in your web server and again in Tomcat - and performs this task automatically for you. The flowchart does a nice job of laying out how all of the pieces work together. The good news is that the Lucee installer comes bundled with the mod_cfm-valve.jar already installed and configured in the Tomcat server.xml configuration file. So in order to get things working you just need to focus on configuring Apache. The mod_cfml website has some good documentation on configuring Apache which I used in this write up. That said, I followed the directions to the letter but still ran into a bit of snag which I will point out below. - Configuring Lucee 5.1 for use with Apache 2.4 on Windows. - Lucee 5.1 was installed using the windows installer. - Apache 2.4 binary was installed from ApacheHaus or Apache Lounge. Next uncomment the lines by removing the "#"
Now that the mod_proxy modules are enabled place the following code at the bottom of your httpd.conf file to tell Apache to route .cfm files to Tomcat for processing. So I uncommented line 5 "Require ip 127.0.0.1". It took me some time to figure it out, but this line was causing a "Forbidden You don't have permission to access /index.cfm on this server." error in the browser. "AH01630: client denied by server configuration: proxy:ajp://localhost:8009/index.cfm"
Download the proper mod_cfml module to match your Apache 2.4 install type (64bit or 32 bit). Next Copy and paste the code below into the bottom of your Apache C:/Apache24/conf/httpd.conf file to load the mod_cfml module. On Line 3 of the snippet you will need to update the "ModCFML_SharedKey" value with the value already configured in your Lucee "server.xml" configuration file located in the C:/lucee/tomcat/conf/ directory. Finally restart Apache in the Windows services panel or by using ApacheMonitor.exe located in the C:/Apache24/bin/ directory. To test the setup I created a simple index.cfm flie and saved it to the Apache root directory C:/Apache24/htdocs/index.cfm. cannot access application on external server (forbidden), can you help me?